Footy snipers | Stand, spray and deliver. Sitting among the slobbering enthusiasm for the NRL opening round lurks the grim notion that there’s going to be a hard luck story somewhere. And today, you’ve got to feel some compassion for Tiger trainee James Tedesco. One of the gut-wrencher tales of round one was delivered by a stadium sniper yesterday at Leichhardt Oval. In my humble medical opinion, HE'S FUCKED. This indicates that the long and stringy salivation of eager anticipation isn’t exclusively experienced by the supporters. After a protracted pre-season polishing his rifle, the gun-toting killer of dreams promptly set up camp at the top of the Tigers rotting timber grandstand and tried his best to temper his itchy trigger finger, but to no avail. And it was the Tigers rookie custodian who wore the raw and searing sensation of the marksman’s impatience with a pinpoint pellet to the ACL. Returning the pill from a kick, he darted towards the line and then buckled as the knee malfunctioned without a single Shark dorsal fin within cooee. Cue the horrible image of the youngster spending 5 minutes chewing on turf and flipping back and forth in pain like a jerky snapper out of water. This got me thinking. Firstly about fish and chips. Secondly, and most probably more importantly, about how prevalent these kinds of innocuous injuries are these days. Can you remember the gladiators of league in the 80’s and 90’s spending lengthy periods off the park for an injury that didn’t involve the opposition in any capacity whatsoever? Tommy and Les: extremely loose and violent human beings. Footy misses you both. I’m sure there were instances of this occurring, but nothing like the number of stadia gunmen incidents we seem to see nowadays. The flavour of yesteryear was blunt force trauma. 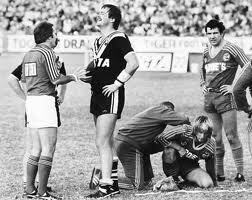 Blokes would be stretchered off the field in the company of the local constable as they gave a police report- usually through a mouth that looked like a sack of smashed marbles- explaining how their jaw managed to meet Les Boyd’s elbow at such high velocity. Stiff arms, knees, squirrel grips and gouges left players and fans in no doubt as to why a bloke would need an extended spell. But rupturing a ligament as you charged towards the line unfettered? I cringe to think of Tommy Raudonikis seeing his fullback hitting the turf and clutching a hinge before tackle contact. 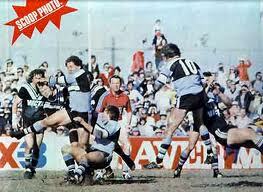 The 80's: when the universal language of the fist reigned supreme. 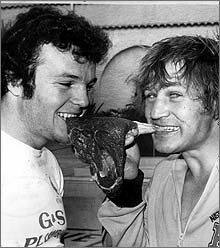 You would hope the medicine men got to the player quick enough before Tommy branded you a ‘shiela’ and then forced you to pack down in the front row for the next scrum, mainly because you had knocked-on in the middle of being decapitated. So does anyone have an explanation for why there are a higher count of snipers traipsing the outer in modern league? After speaking to my contact sports cronies, the general consensus seems to be that the pace and intensity of the modern game is a contributing factor over time. "I didn't lay a hand on him sir. However, as for my boot..."
So is it wear and tear, or is science also playing a part? Could modern training techniques and the highly-tuned nature of the player’s bodies be spawning this new trend of twitchy fragile knee sinew? It’s possible, however I don’t remember the last time I saw a Ferrari leave the mechanics in top nick only to see it snap a fan belt a few blocks down the road. What’s more, I also struggle to recall witnessing a couple of 1982 Cortinas bashing the daylights out of each other in a back alley before driving home with nothing more than a few dents. My sporting brethren, do you have a medical explanation for snapping ligaments? Why are blokes knees deciding to collapse in the middle of a match after weeks of running the same line at training? Do we have anyone out there with an old medical qualification lying around that they can whip out to be the website’s resident doc? Does anyone know the sniper? Posted in Rugby League, What do you think? I rekon the Dingo is a fair candidate for the sniper. He’s been missing in action for a while, ever since they reopened the Azaria Chamberlain case. Another suspect is Mitch Brown. Yep, like all sports these days, rugby league clubs consult with a bevy of Uni grads specialising in the likes of fitness, physcology, and nutrition to improve their players performance. Yet with all this knowledge and support, we have blokes dropping without being tackled, tearing pecloral muscles and complaining about depression, or in Willie’s case ADHD. That didn’t happen back when Tommy and Les played. Donning my honorary G.P.hat,i believe i can satisfy your mystification. In my day ( days of yore) these injuries just did not occur with the proliferation of today. OVERTRAINING is the answer.Once upon a time there was the football season,then the off season.This was the time to hit the piss,bulk up on pies ,peas & spuds and then present for training looking like the Michelin Man.It took half the season to get fit and then the real contests began.Apart from the carnage unleashed on the field there were smatterings of breaks,-ankles,legs-but never with the constant injury woes we hear of today. So bring back the biff. Yep, too much time with the dumbells, fat wallets, ink injections and hearts the size of peas are my diagnosis. You blokes have answered the conundrum. I should’ve called Senior’s experience from yore straight off the bat. Let us rally for the professional era to be phased out so we can return to a part time work/pie intake balance. For the good of the knees. And Mr Brown…. the dingo is in the crosshairs! I remeber the days when dallas donnelly would have a can of coke at halftime!! These blokes today are too finely tuned & SNAP/Break ligaments etc because of it. Training should go bac two nights a week then off to the pub to celebrate the good work!